Tuesday (24-July-2018) — New Jersey. For the last several days it has been raining. Rain is good as it is keeping me busy trying to restore some of my wildflower meadows that had been taken over by the invasive “mile-a-minute” vine. I tried many methods to get rid of the vine. Ultimately, I ended up having to use a herbicide. Now I am re-seeding with various wildflower seeds. I hope some take. Today, I noticed a Clearwing Moth on my Zinnia flowers (Hemaris diffinis, snowberry clearwing,”hummingbird moth”). Later on I saw a caterpillar chowing down on one of my Dill plants that I was letting bolt and go to seed. I am not sure what butterfly it will become (thinking a Black Swallowtail?). 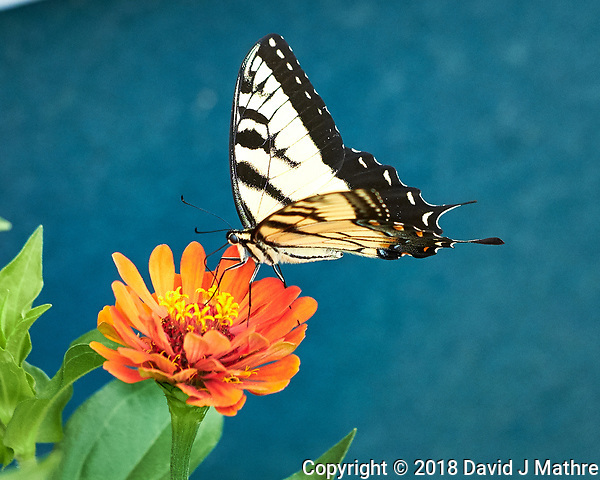 Later on I noticed a yellow (tiger) swallowtail butterfly on the Zinnia flowers. While checking the tomato plants in the Garden Tower I saw a giant Tomato Hornworm — covered with hundreds of the parasitic wasp cocoons. These tiny wasps are a good thing as a natural pest control for the Tomato Hornworms.